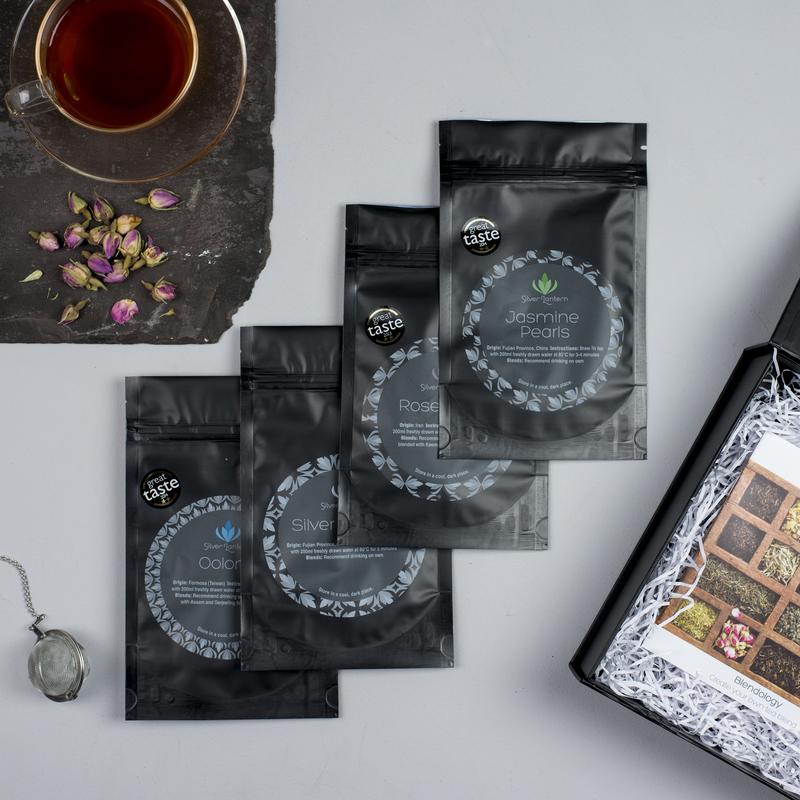 Four of the finest loose-leaf teas hand picked by you and presented in a beautiful gift box. The perfect gift for any tea lover. Imagine the recipients delight when they receive a selection of their favourite teas - all carefully chosen by you. This personal touch makes for a really special gift. Choose any four teas from Silver Lantern Tea's extensive range of black, green, oolong, white and herbal teas. 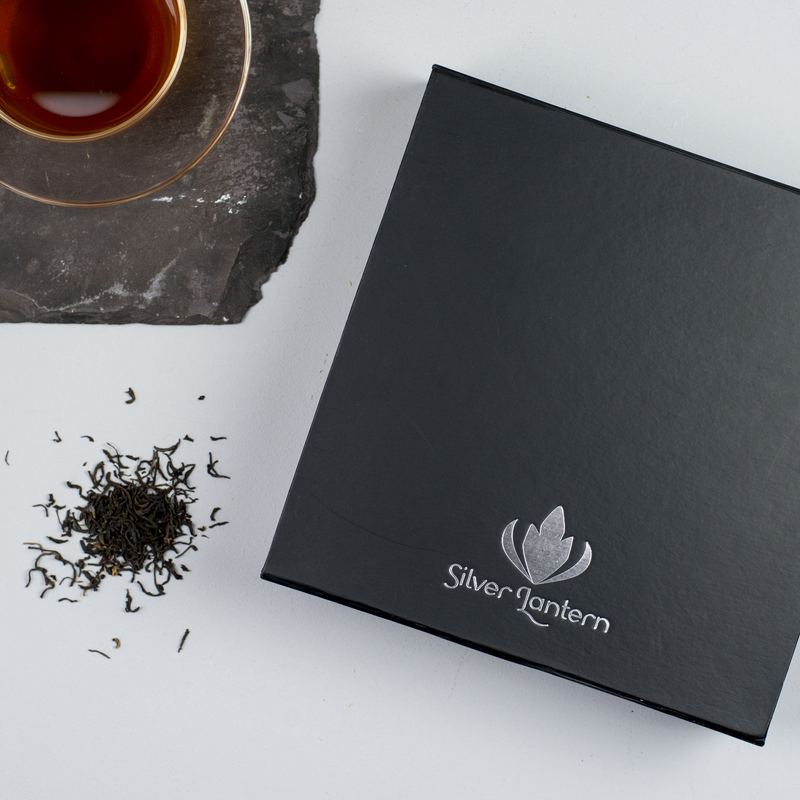 Your tea selection is beautifully presented in a matt black gift box embossed with the Silver Lantern logo in metallic silver. 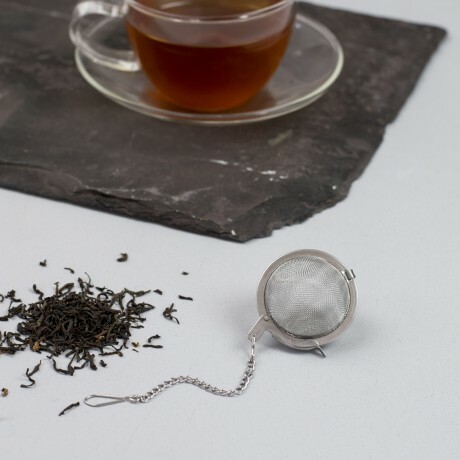 Once you lift the lid, nestled underneath tissue paper, you'll find four pouches of the finest tea along with a tea ball infuser, and a tea blending booklet with recipes for preparing your own tea blends. A truly wonderful gift to receive. Each pouch of tea contains 10- 20g of loose leaf tea which is enough to make 10-20 cups of tea. A majority of Silver Lantern's teas have been awarded Gold Stars at the Great Taste Awards, so you can rest assured that you are receiving the finest quality tea. Silver Lantern's teas can be enjoyed on their own or mixed together to create classic tea blends such as English Breakfast, Earl Grey and Russian Caravan. Varieties of tea include Assam, Darjeeling, Ceylon, Ceylon & Bergamot, Milima, Keemun, Lapsang Souchong, Yunnan Black, Dragowell, Gunpowder, Yunnan Green, Jasmine Pearls, Jasmine Yin Hao Lotus, Silver Needle, Oolong, Chamomile, Peppermint, Lemongrass, Rose Buds, Vanilla Rooibos and Yerba Mate. More information on each of the individual teas can be found by clicking on the specific tea product on Silver Lantern Tea's storefront. If you need help choosing the teas for inclusion, please don't hesitate to contact us. We're always happy to suggest a selection based on the recipients general tea preference.